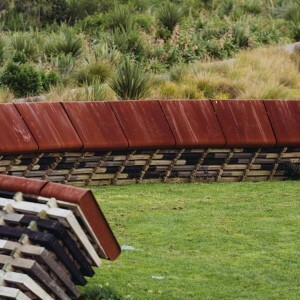 LAND: as a nation, and as a practice, we are deeply embedded in the land. We are physically and spiritually connected to it. The land is where we are from, it is where we stand, and it is where we will return. 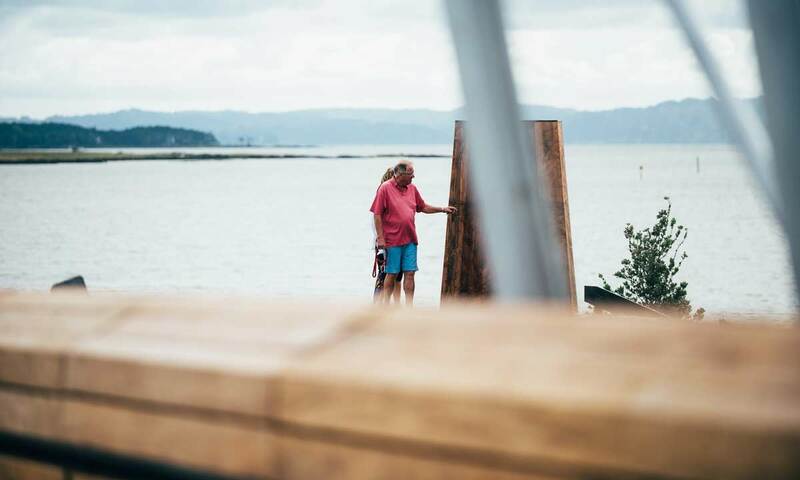 As designers we read the land, we listen carefully to its stories and we sense its moods; we tread lightly, pay respect and give it room to breathe. 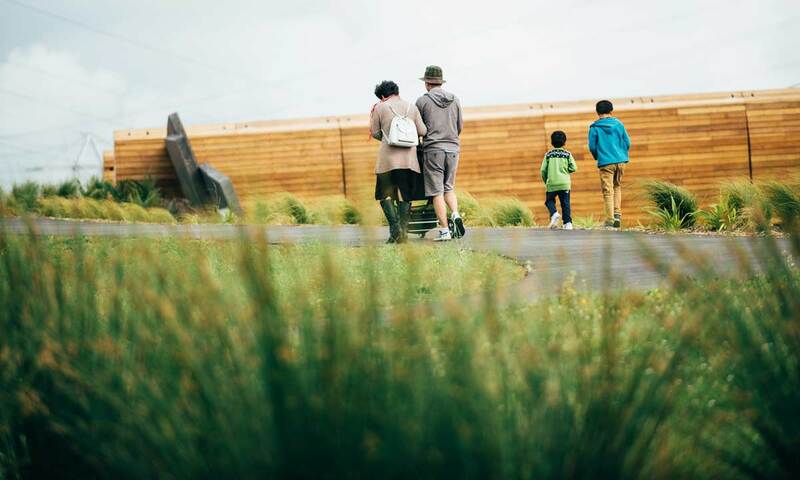 In this way we explore deeper connections to nature, working with the underlying geology and ecology to protect, enhance and create places that inspire and endure. 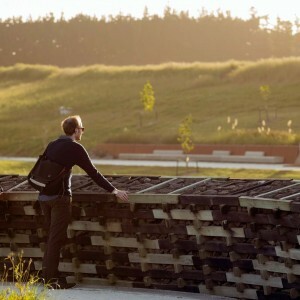 PEOPLE: Collectively humans have shaped our land, but more fundamentally, it is the land that has shaped us. 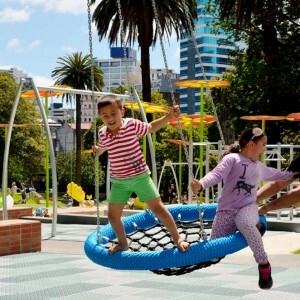 In our work we aim to strengthen relationships between people and places. 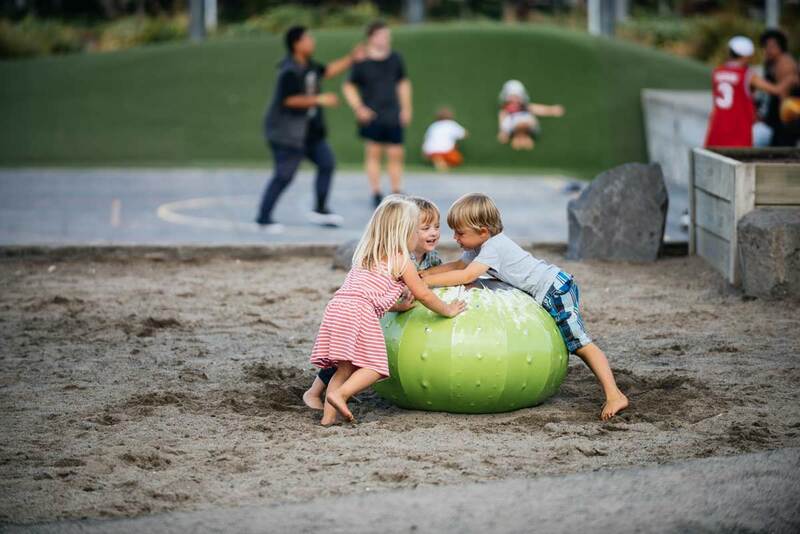 We are passionate about creating inclusive, healthy, inter-generational communities; a key aspect of this is connecting people with their environment. 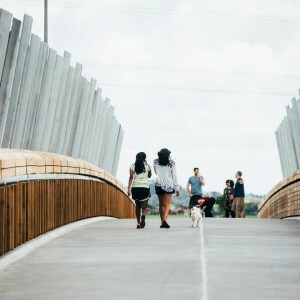 In the process of designing places where communities live, learn and play we engage fully with people, constantly searching for deeper meanings and richer connections. 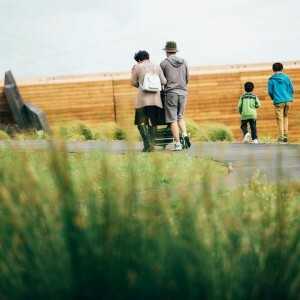 CULTURE: when people come together to inhabit the land, politics, planning, heritage, art, craft and technology all come into play; and in the process culture is created. 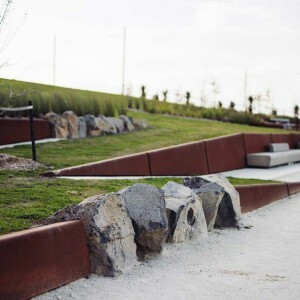 Shaping land, making spaces and forming architecture are deliberate, cultural acts influenced by our collective relationships, habits and codes. To do these things well, and in so doing help shape our collective cultural identity, carries with it a huge weight of responsibility. 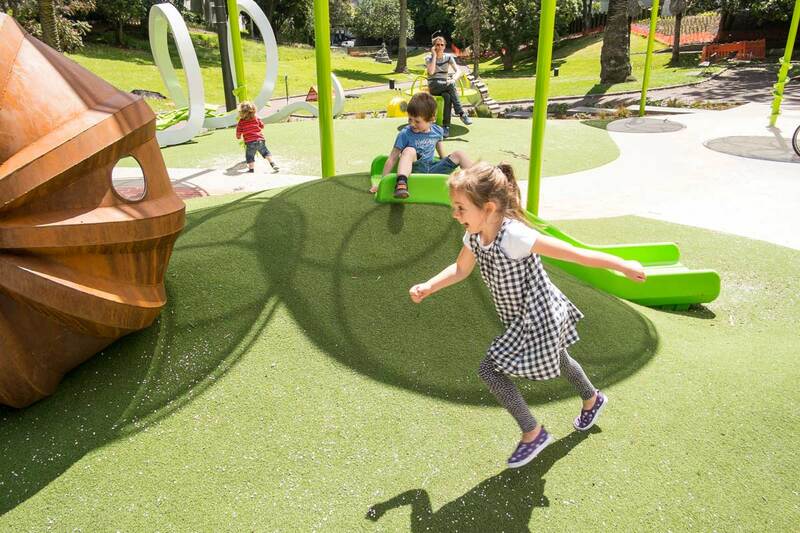 We take this seriously, but we also inject elements of humour and play; we follow a process of design enquiry that is creative, inclusive, collaborative and inspiring. 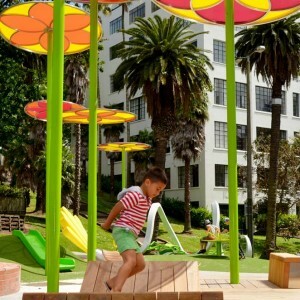 In our experience this is the only way to design unique, integrated environments that contribute to wider cultural conversations. We work with conviction, confidence and humour. We celebrate diversity, but there are certain core values which are carved into our characters. 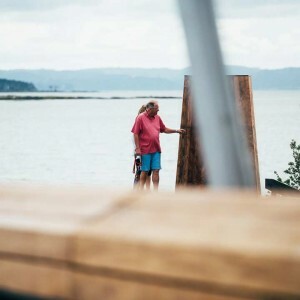 Together they define a distinctive ‘Isthmus attitude’ and influence how we approach everything that we do. These values are non-negotiable. CURIOSITY. We listen, question and challenge. CREATIVITY. We solve problems in imaginative ways. AUTHENTICITY. We design with meaning, purpose and respect. TENACITY. We get the job done. To realise the full potential of every site and every brief we take an open-minded, inquisitive and inter-disciplinary approach. We start without knowing the answer. We pay attention to the creative process. Our flexible studio culture incubates ideas; the closer and more collaboratively we work together, the more chance ideas have of spreading, growing, cross-pollinating and transforming. We call this way of working ‘no boundaries’ because we think in terms of opportunities rather than constraints. We work in a cyclical process that fluctuates between expansive and reductive thinking. 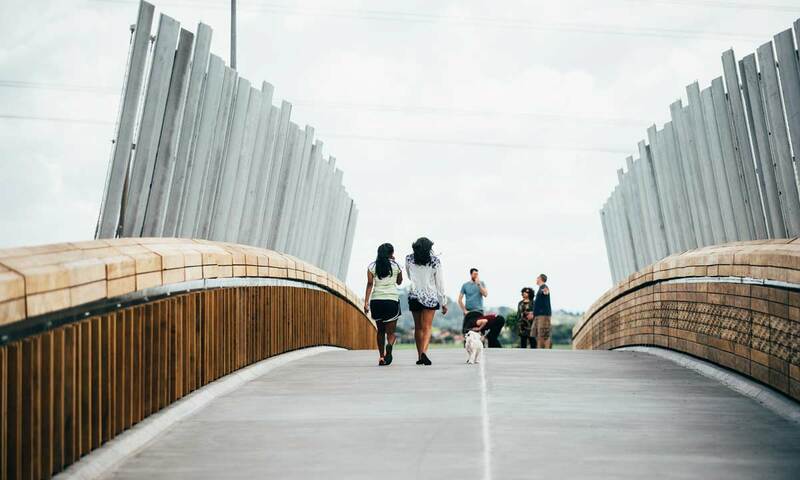 Breadth: At the initial stages of a project we harness many perspectives from our inter-disciplinary team and stakeholders – everything is up for grabs. 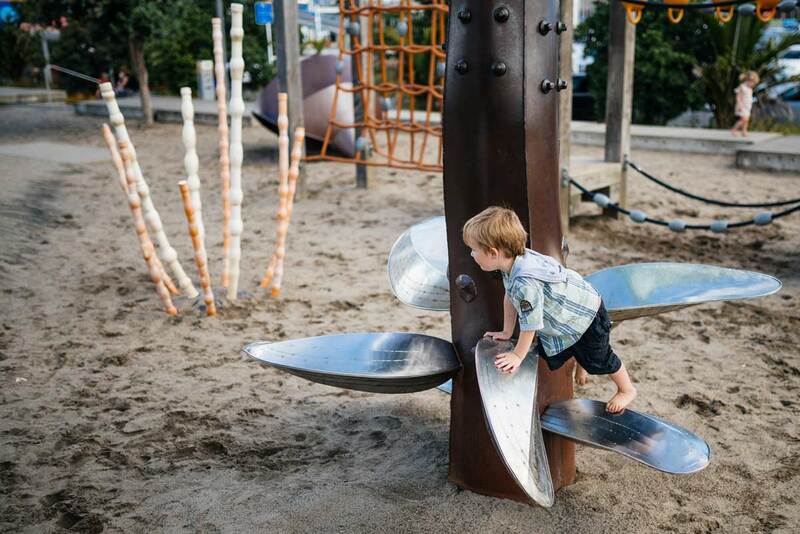 Explore every opportunity. 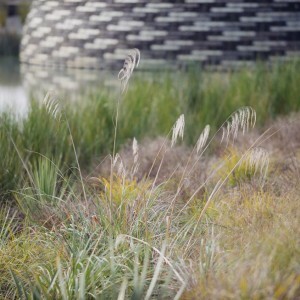 Depth: As the project develops and the design direction becomes established, we switch to reductive thinking – technical, discipline specific expertise. 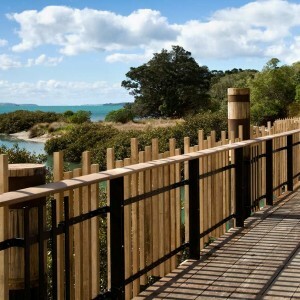 Conceptually, the walkway is a fine line that traces the edge of an exquisite piece of coast. 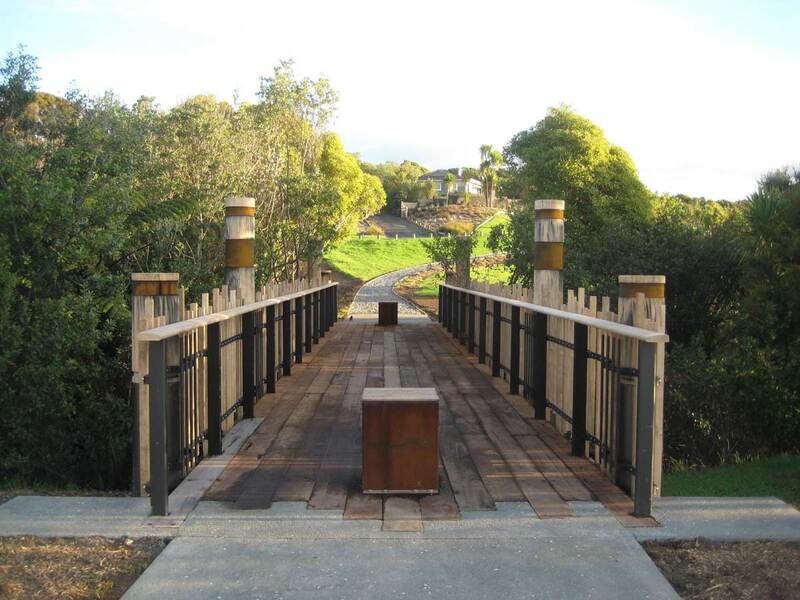 At certain points across the varied terrain, shared pathways meet waterways or edges that require bridging elements. 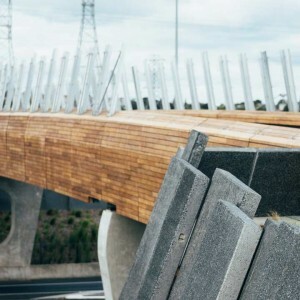 These structures are recessive and incidental to the landscape but they are also important coastline connections that allow exploration by foot and by bike. 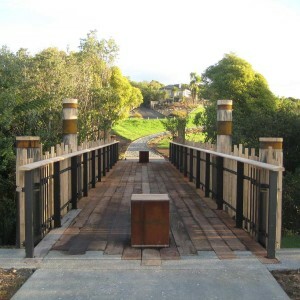 The new bridges and boardwalks take their design cues from vernacular elements in the area and, when positioned near a promontory, each instance is set back so as not to take from but to add to the meaning and majesty of the various places, spaces and views. 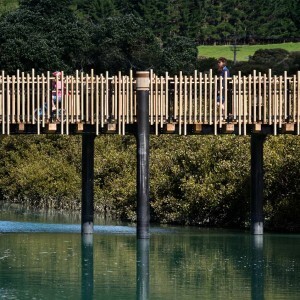 The six kilometre-long coastal walkway and cycleway, completed in 2014, was designed to connect Maraetai with Beachlands; two increasingly populated settlements on Auckland’s ‘Pōhutukawa Coast’. 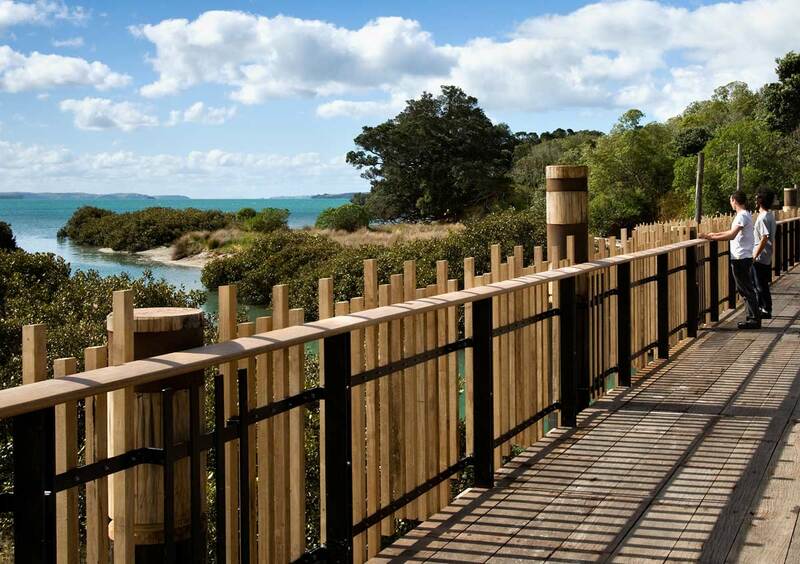 The walkway follows the coastal contours of this south-eastern slice of land, sensitively tiptoeing past sites of archaeological and cultural significance – the result of the region’s hundreds of years of occupation by Ngāi Tai – while offering up long views of the Hauraki Gulf, Waiheke Island and Coromandel Peninsula. 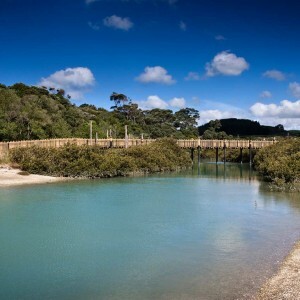 The coastal landscapes include the popular Maraetai beachfront, where white sands, grass, pōhutukawa trees and swim-ability make a classic summer location, and the cliff-topping Traceys Walk, with its shell-lined path and views to Waiheke. The rocky headlands of Te Pene Point, which ease into the sandy Omana Esplanade, are a good place from which to watch birds working while the tides ebb and flow. 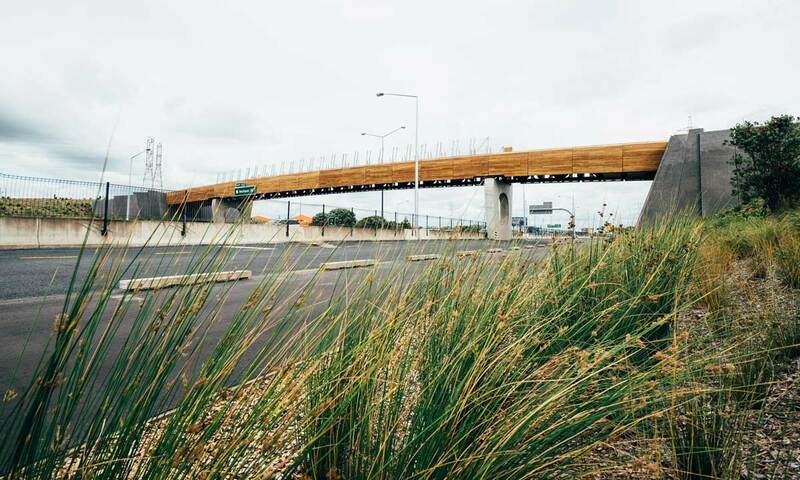 At this junction between coastal housing and farm park, it is easy to imagine the woolsheds, sheepdogs and stock transportation barges that are part of the history of this area. 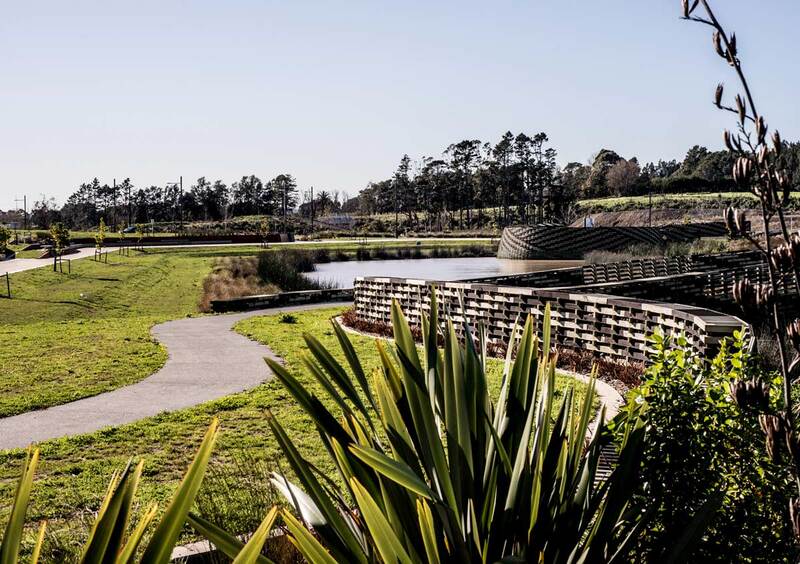 One hundred years ago, Auckland’s city fathers carved a long, green finger of land out of the residential allotments hugging the banks of a Stream which descended into the city centre. 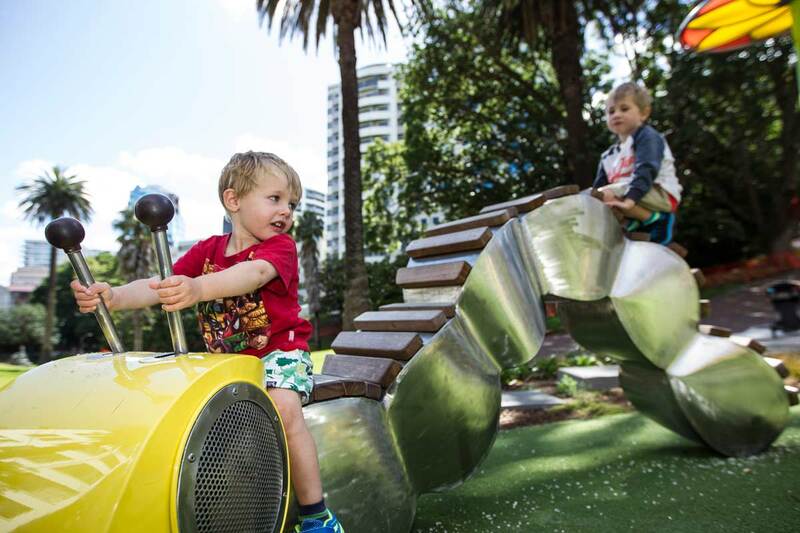 They named it after Sir Arthur Myers, the benefactor who made it a gift to the children of the city. 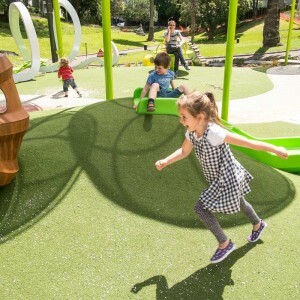 Modelled on a ‘reform park’, a popular American typology of the time, it was primarily the result of Myers’ concerns about rampant urban growth and the provision of safe green spaces where children could play within the city. Fast-forward to the present and the same concerns are held still. 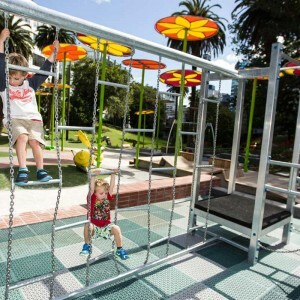 Population growth coupled with housing availability and affordability issues has led the city to consider compact forms of housing, with the associated reduction in yard size and a growing need for communal outdoor spaces. 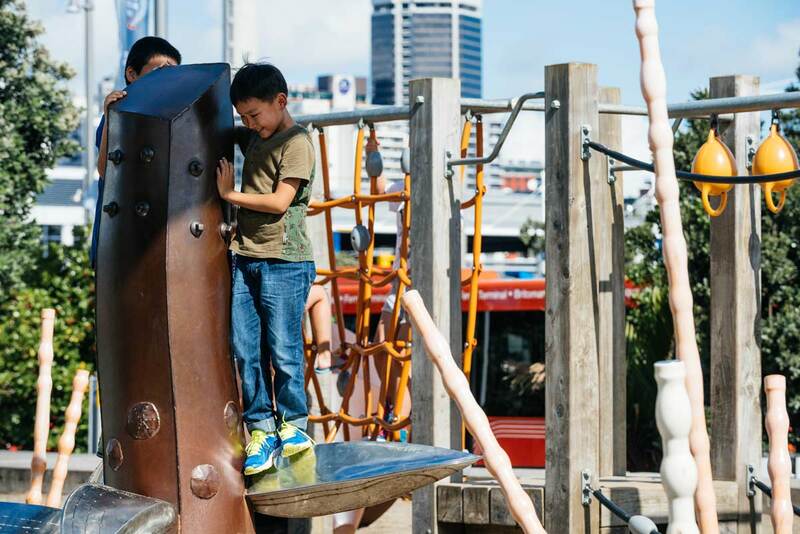 Inner-city playgrounds are still rare in Auckland and the provision of quality spaces for children has become a pressing issue in a city quickly exchanging traditional ‘backyard freedoms’ for the necessary adjustment to compact living. 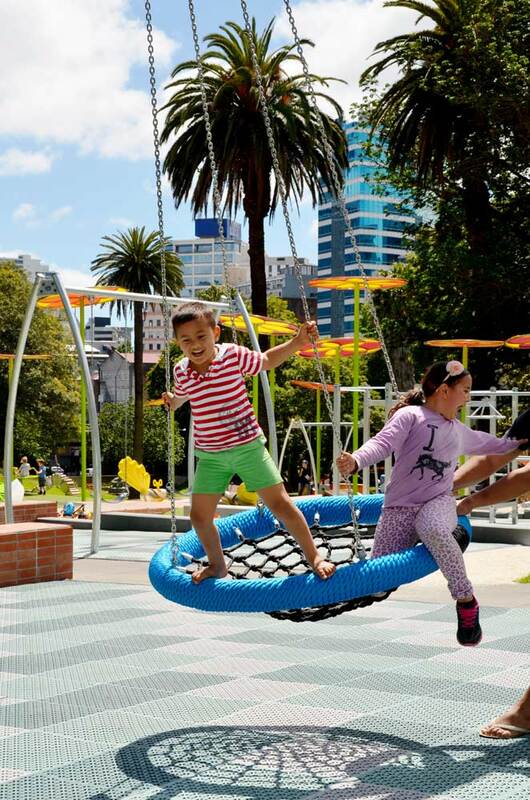 The upshot of all this is that public parks, streets and playspaces need to work harder. 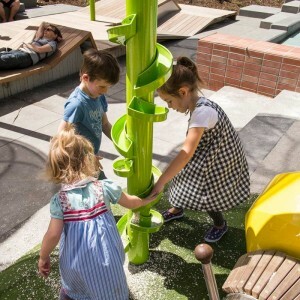 The theme of ‘play in the backyard’ was developed with inner-city kids a destination that evokes the feeling of an overgrown garden. It is suggestive of a children’s story, with elements of surprise and surrealism incorporated into all elements. 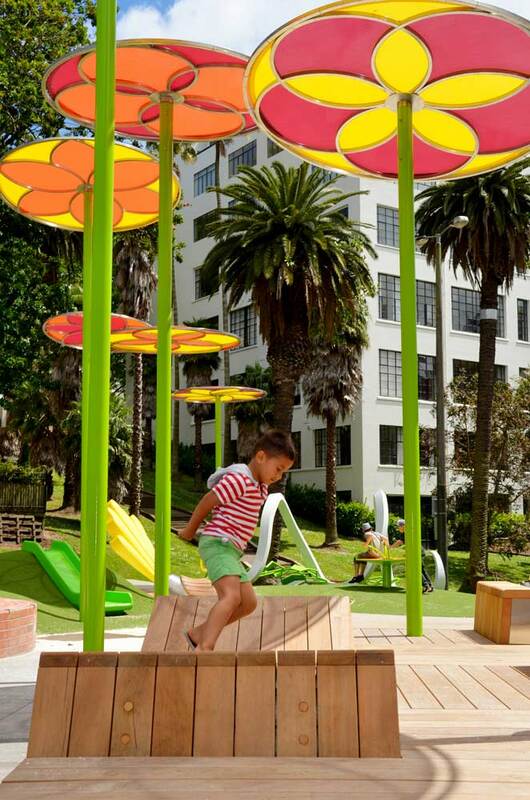 Quirky, oversized and interactive garden birds and insects occupy the garden; brightly coloured, disk shaped flowers supported on tall, slender stems provide shade; and sprawling vines and large, permeable leaves provide the perfect fodder for climbing, swinging and balancing. This is a place for both mind and body to run a little wild. 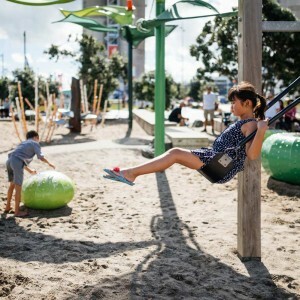 For 35 years the people of the suburb of Onehunga, Auckland, were separated from their foreshore and a promised coastal park, originally intended to help mitigate the loss, was never built. 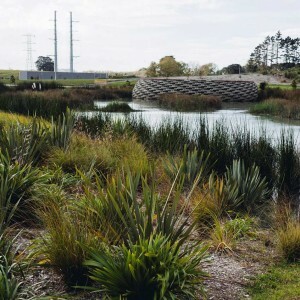 Worse still, the unmitigated landscape was damaged further by other industrial intrusions – pylons, land reclamation and the contamination of stormwater, which accentuated the degradation of the physical, cultural and ecological qualities of the inner Manukau Harbour. 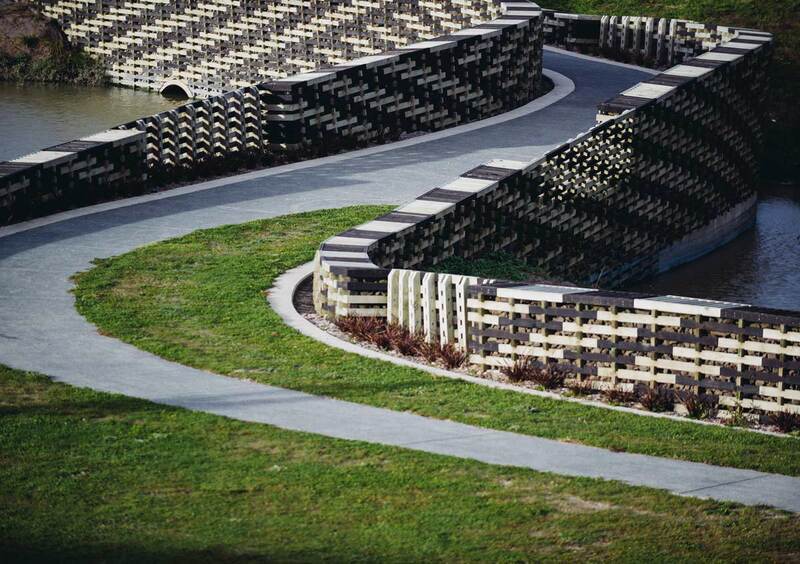 This is a true landscape project – creating land and creating habitat. 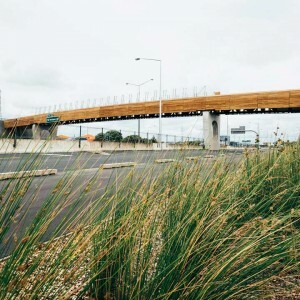 The objectives of the project were simple – recreate the harbour edge and recreate the spirit of this piece of coast by creating new places for people and new habitats for the flora and fauna that existed before the construction of a motorway. 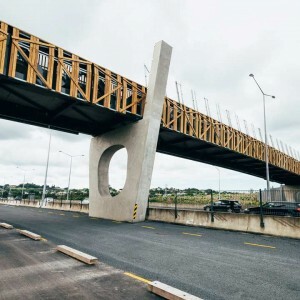 The key moves have been to: acknowledge and build on the existing volcanic landscape; replicate the original coastal cliff alignment by displacing the line to the seaward side of the motorway and building a new coastal edge landscape behind it; and connect the coastal edge via a new pedestrian and cycle bridge. 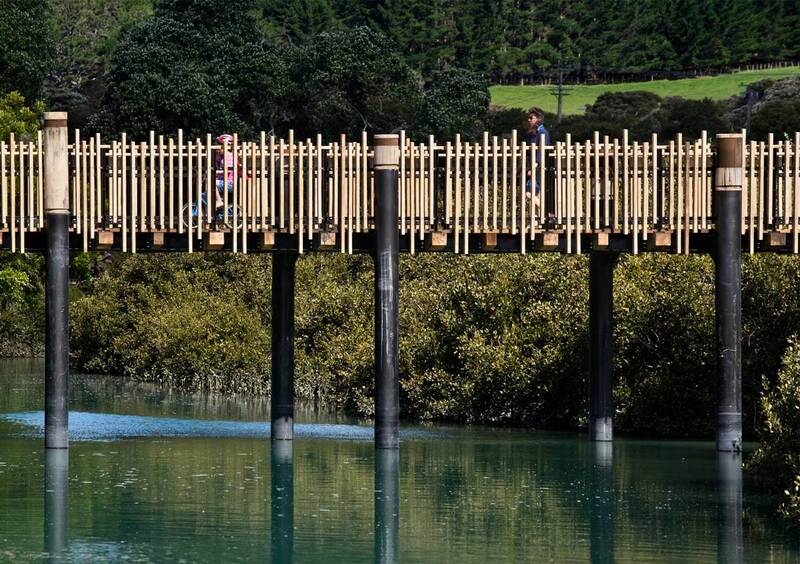 Te Hokinga Mai, the return home, is a good name for such a long anticipated project. 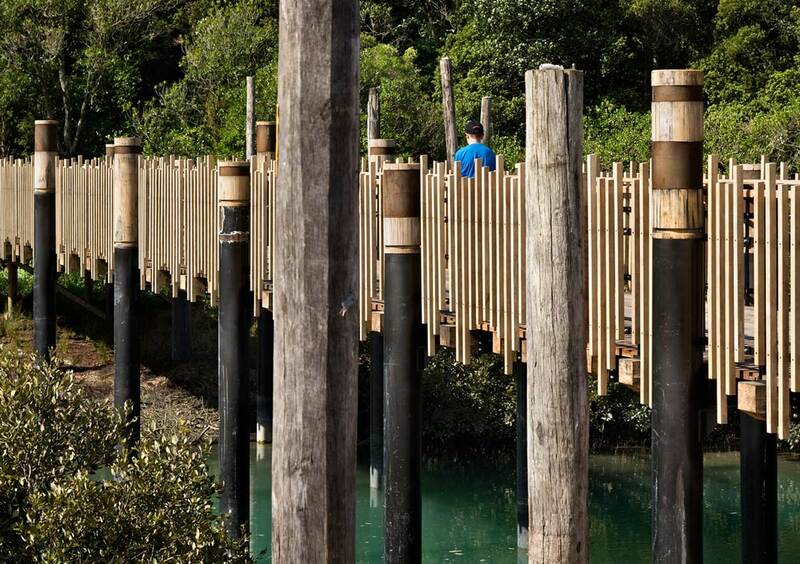 A 6.8-hectare coastal park has been built on reclaimed land and formed more than a kilometer of new coastline. 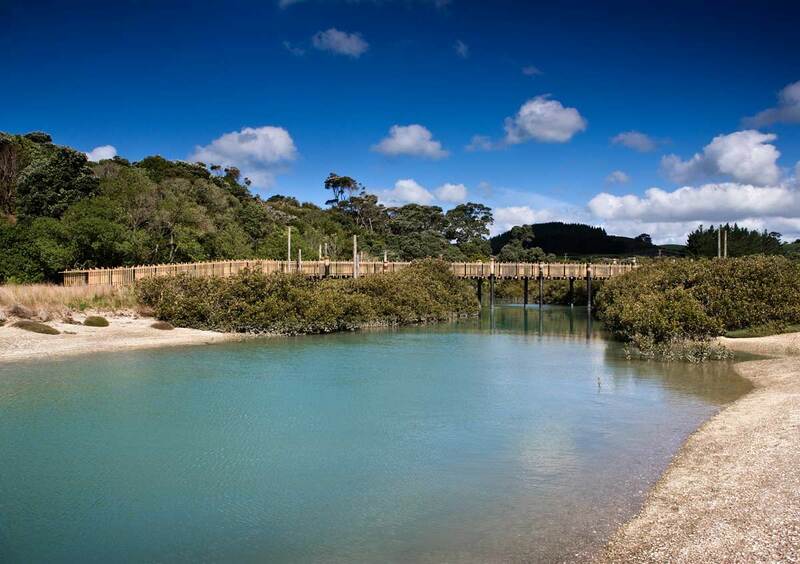 Within that area are nine new beaches, three of which are layered with sand a metre deep to encourage swimming. 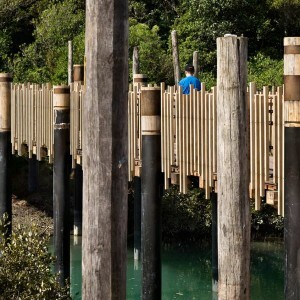 One gravel and shell beach is inaccessible, with baffle planting to discourage animals and to generate an environment suitable for nesting birds. 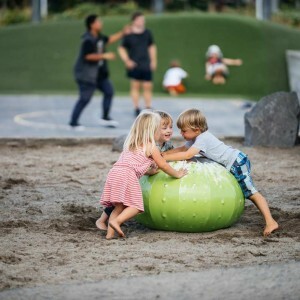 With construction complete, endangered dotterels have begun to colonise the area, alongside local residents. 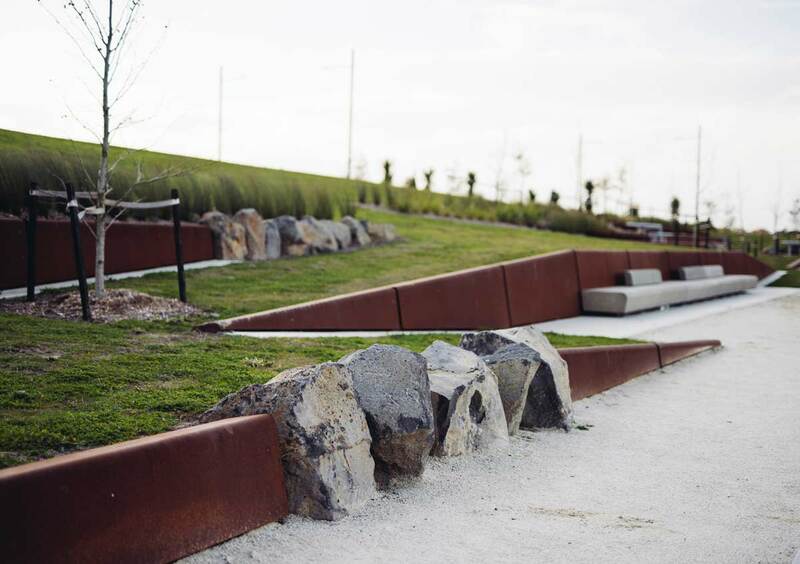 Kopupaka Park represents a design-led approach that integrates community amenities with engineering and ecology. 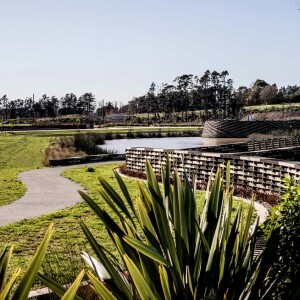 What once might have been considered ‘space left over after planning’ has been transformed into a hybrid park that challenges expectations around the design and use of stormwater reserves, and illustrates how urban growth can be balanced with ecological restoration, the creation of new public space and the development of a strong sense of place. 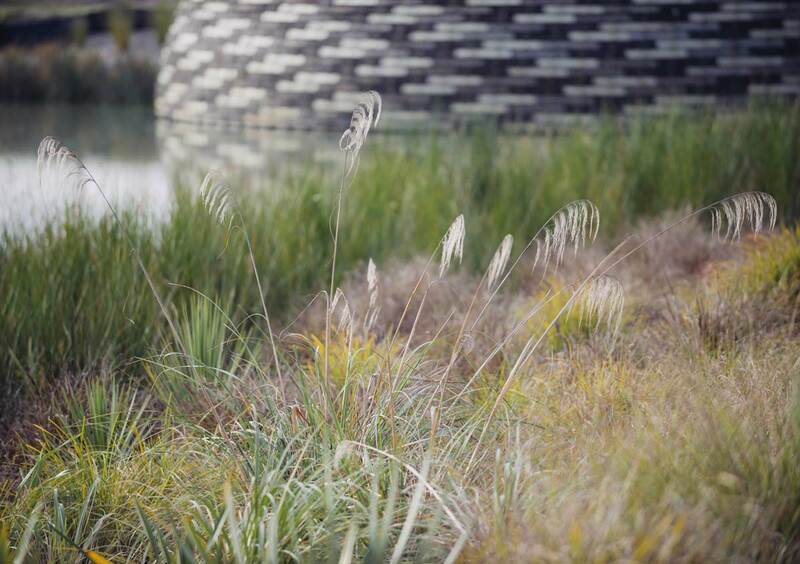 The notion of weaving histories and overlapping functions together is the dominant design narrative of the park, with a concept of ‘thread, weave and gather’ articulated in physical form through the merging tributary and constructed wetlands of the park. 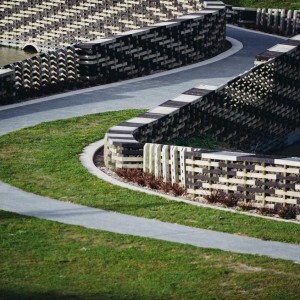 While Kopupaka Park provides the infrastructure for the attenuation and detention of stormwater run-off from the streets and buildings of a new town centre, this new type of civic infrastructure, where traditional boundaries, constraints and functions overlap, has a tight overlay of cultural, ecological, community and (mostly unseen) engineering objectives. 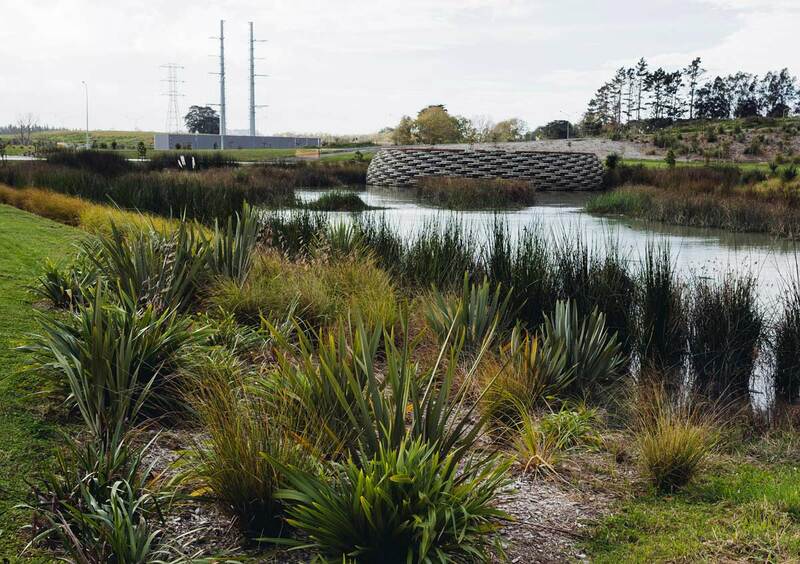 What is visible are the cultural aspects of the project, especially the curving timber ‘baskets’ that have been integrated into the edges of three main wetland ponds. 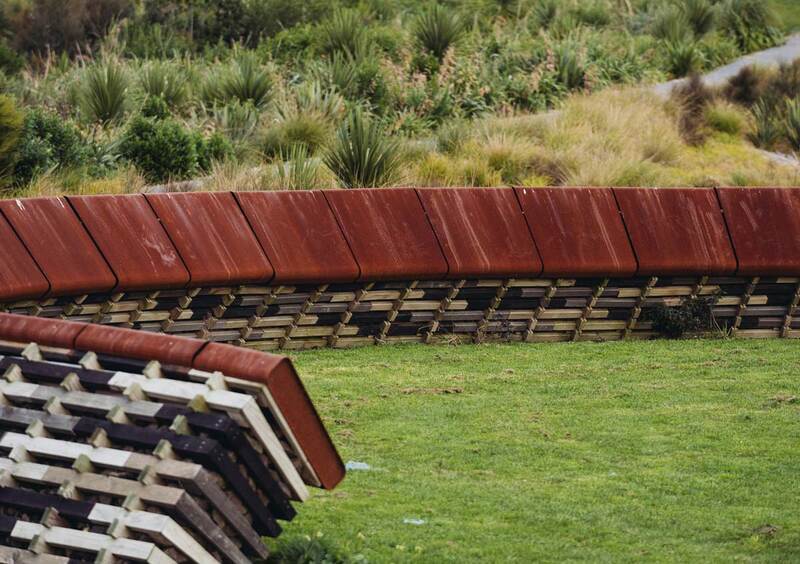 These functional sculptures abstractly reference harakeke (flax) woven into kete (baskets) and hīnaki (eel pots). 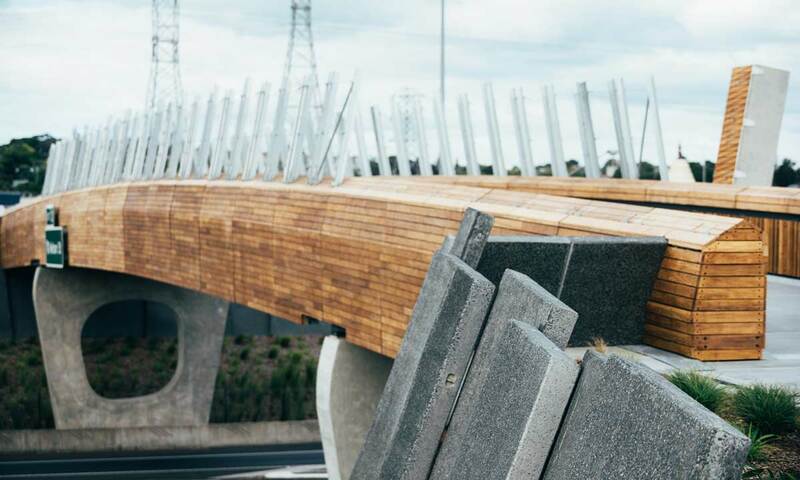 While the forms appear complex and bespoke, they are in fact constructed from a standard timber-crib retaining system: an off-the-shelf system adapted to allow the expression of a traditional weaving pattern in curvaceous form. 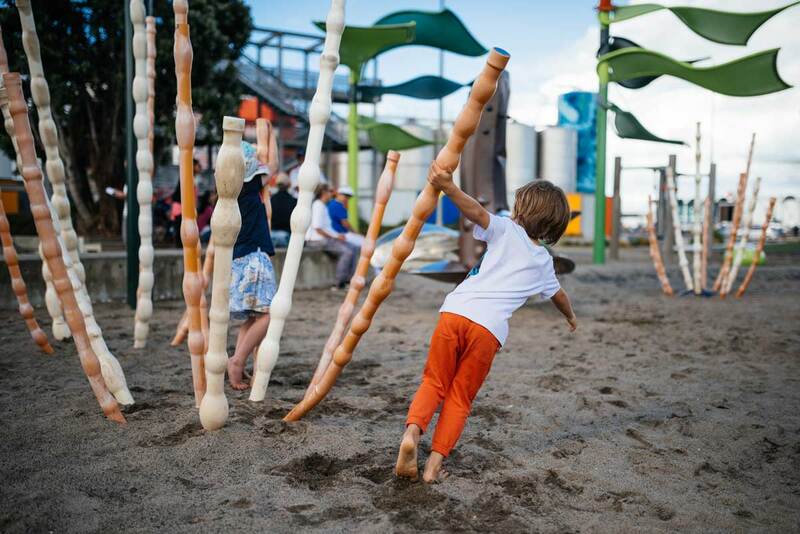 Amidst the emerging Wynyard Quarter’s post industrial and maritime spaces sits a sand-carpeted playground: a place of tactility and texture that has captured the public’s imagination. 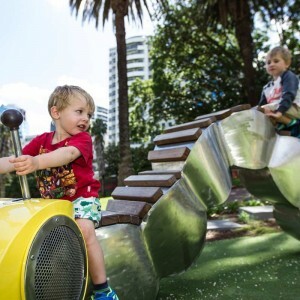 The brief called for an innovative temporary playspace of high quality that would be thought provoking, challenging and accessible: an equivalent to the aspirations many Aucklanders have for this newly accessible part of the city. 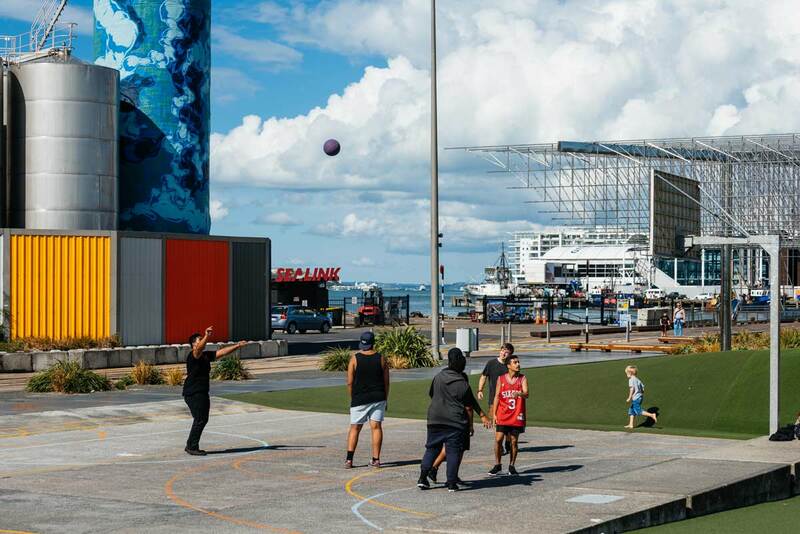 ‘Site 13’, where the playspace sits, is a valuable development plot with a central position to the west of North Wharf. 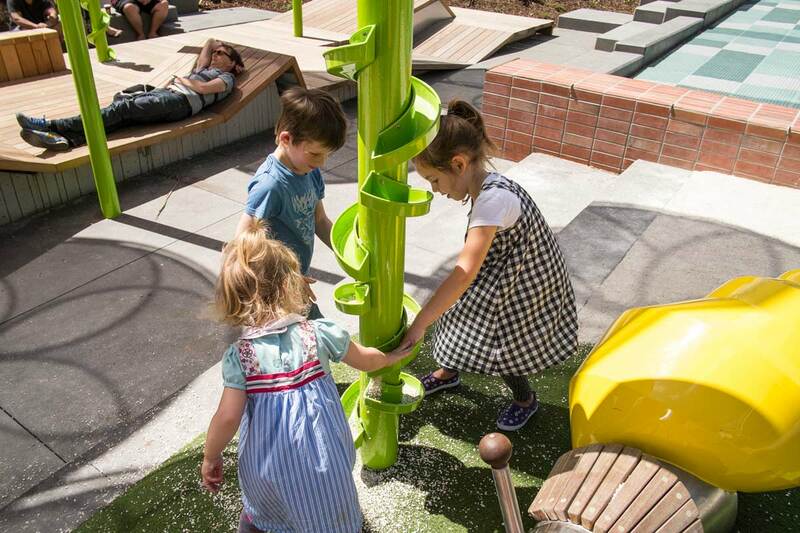 The design-and-build time-frames were short – as was the proposed lifespan of the playspace. 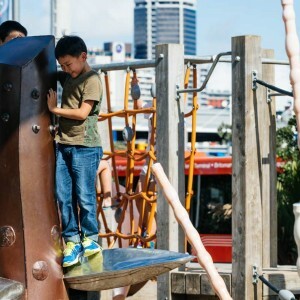 Later, when the public caught wind of the playground’s temporary nature, a Facebook page, ‘Save the Wynyard Quarter Playground’ was started – a clear hint at how much the community valued the new facility. 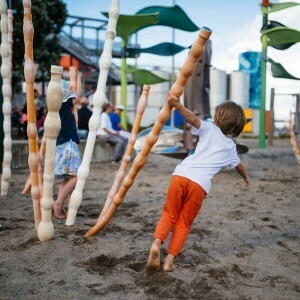 Wynyard Playspace is dotted with over-scaled sculptural objects, inspired by natural sea-floor habitats, constructed with remnant materials from the repurposed wharf landscape and, from the carpet of sand on the ground up, fully playable. 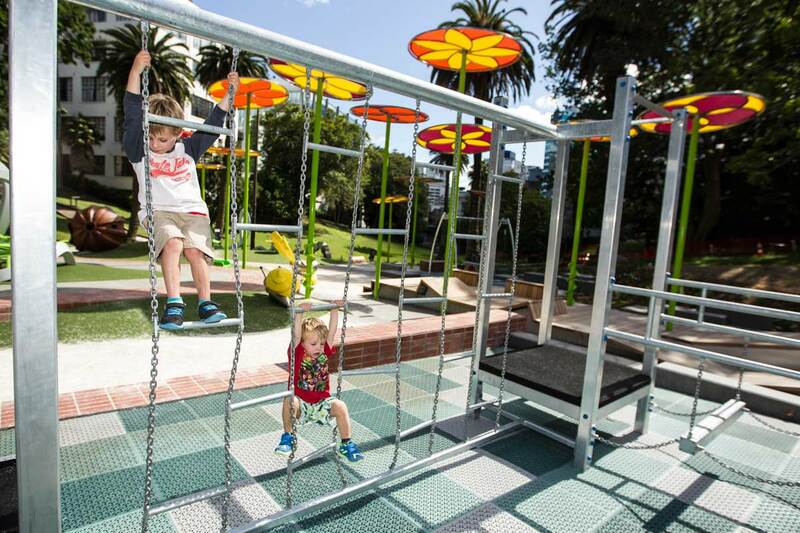 From the outset, Wynyard Playspace has been a low-cost, big impact success. 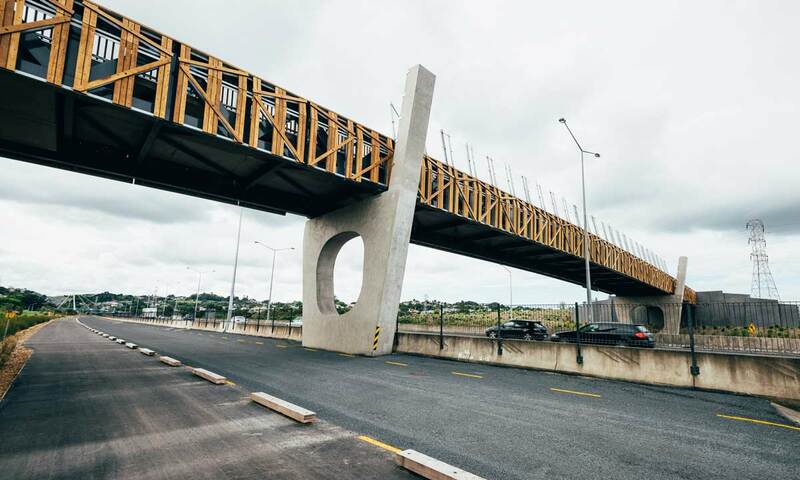 It stole the show at Wynyard Quarter’s opening and has symbolised the rebirth of the entire area. 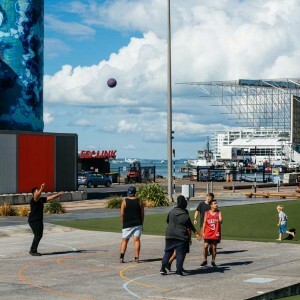 Its popularity extends the use of the precinct and it ensures activity through to the late evening as the informal basketball games that take place on the half-court succeed younger daytime crowds. 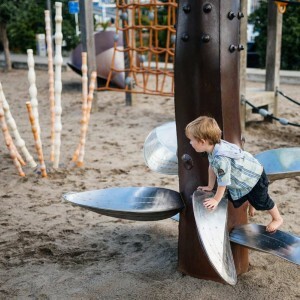 Here is a city space that is near the water, vivid and filled with movement. 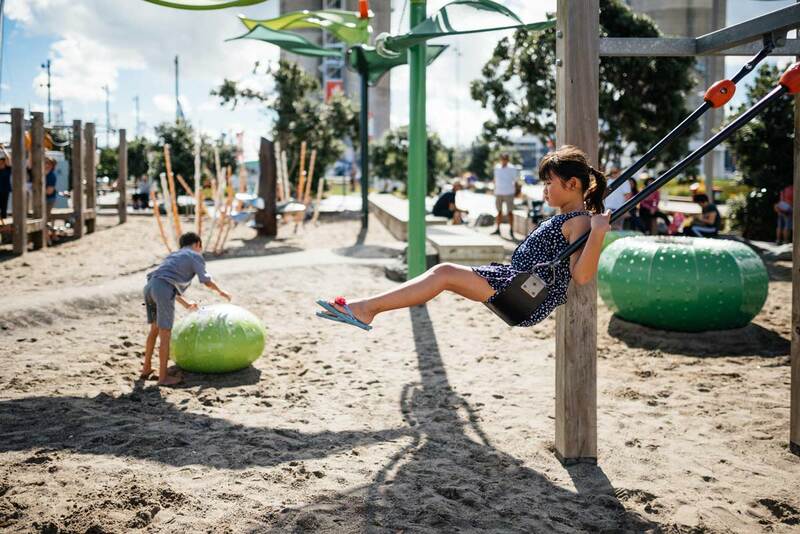 In a once solely industrial area, now transitioning to new, mixed uses, here is a clear signal to all that kids, too, are welcome in Auckland city.